Royale Fleur Kashan Silk Carpet is woven in pure silk Kashmir rug with an intricate design pattern lovingly handcrafted by our skilled artisans. These rugs are unique and will make any space stand out due to its sheer texture and easy to match tones. This Kashan beauty has been meticulously handcrafted by our talented weavers. This rug is one of its kind and is a unique product. This is a Handmade Kashmir Pure Silk on Cotton rug.This rug is Handmade in cotton base and has pure Kashmir Silk on top. Number of Knots in this rug are 324 knots per square inch. 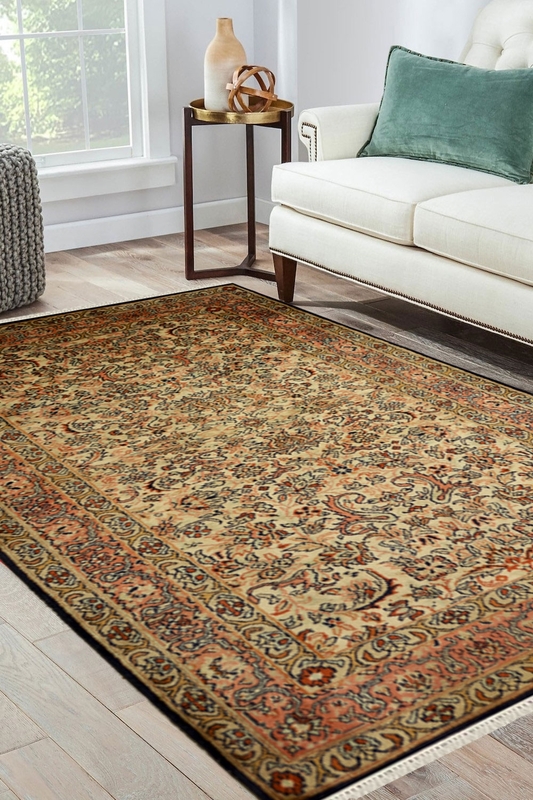 The primary colors are cream and rust while the border has an intricate pattern with tiny floral motifs.This rug is perfect as a feature rug in a space with subtle interiors and can also be used as a wall hanging. It has taken about 5-6 months to weave this gorgeous rug.